"﻿Comin’ Home Baby" – that’s how the LP begins and that’s what catapulted it right into the charts. Not to one of the top places, but from this time on Herbie Mann was one of the superstars in Atlantic’s collection of jazz musicians. He was known as 'our man with the flute', and the critics in the early Sixties were full of praise for him. He became even more famous, and probably richer, through soundtracks and later on sometimes rather commercialised productions. Well, good for him. 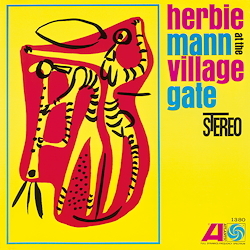 'The Man' serves up jazz pure on this recording, made live at the legendary Village Gate club, which is no wonder considering the rhythm group that includes Ahmad Abdul-Malik and Rudy Collins. The composer of "Comin’ Home Baby", Ben Tucker, also makes an appearance as a guest soloist before the two Gershwin numbers from "Porgy And Bess" offer a wealth of rhythm pure. On the cover text of the LP, Willis Conover, who hosted the Newport Jazz Festival as a sideline (older jazz fans will know his baritone voice from AFN broadcasts), describes in detail the ethnic background of the musicians who come from all over the world – from Romania to Puerto Rico. The three numbers are by no means commonplace. Perhaps a tasty flute cocktail would be a good description. This true rarity from Atlantic’s treasure trove in the early Sixties has long been marked down on the wish list of many fans and at long last it’s available again.